Get ready for Sean Simmonds. Though he might be a new solo artist, he is definitely not new to the industry, previously being a member of Sharon Riley and Faith Chorale as well as a member of the contemporary group Chapter 5. The Toronto native and Atlanta resident spoke with GOSPELflava.com about his experiences with those groups, the songs on his debut project, and what separates him from other urban Gospel artists. GOSPELflava.com: Who is Sean Simmonds? Sean Simmonds: I'm a real dude that has experienced a lot of the hurdles that life can throw at you. I'm a father. I'm a husband. I'm also the executive president of my own record company. I'm just a blessed individual. God has just commissioned my life and has brought me a mighty long way. Now He's put me on a platform where I can tell my story to the rest of the world. I'm very excited. God has prepared me for this journey. GOSPELflava.com: Your album, True Story, is filled with jams. One stands out in particular, both in lyrics and in music. What is the story behind "God Bless the Ghetto"? 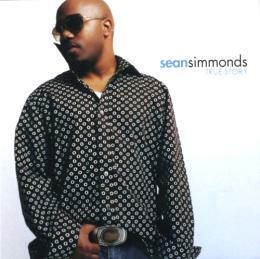 Sean Simmonds: "God Bless the Ghetto" is basically a prayer for the ghetto. I grew in what I like to reference as lower class living. You don't have the luxuries of life. Looking on the outside in after I had been delivered from that area, it was always a prayer of mine for God not to forget about His people in the ghetto. A lot of people in the ghetto are doing things by any means necessary to survive. It might have been hustling or prostitution just to make ends meet or feed a couple of mouths. It was a prayer of mine and a word of encouragement to them to say that God hasn't forgotten about you. That song is dear to my heart. GOSPELflava.com: There are plenty of urban Gospel artists out right now. What distinguishes you from the pack? separates me from any other urban Gospel artist. For example, "God Bless the Ghetto" addresses a topic that a lot of churches won't discuss, even though a lot of them are located in the urban areas. I think my record exemplifies a real talk, a real life approach to real situations. There's no holds barred. There's no hindrance. There's no sugar-coating. I'm just speaking based on life experiences, and praying that someone listening will receive a revelation or a motivation to change. It's a motivational tool for change. GOSPELflava.com: How did your time spent with Sharon Riley & Faith Chorale and Chapter 5 prepare you for where you are now as a solo artist? Sean Simmonds: Singing with Sharon Riley was my initial introduction to the industry, and that has prepared me in a major way. I learned the ins and outs as far as going on the road, and what it means to be humble. You have to pick up your own bags. You don’t have anyone picking up your bags after you when you are a part of a choir. I learned what it means to sing behind someone. I learned discipline and direction. With Chapter 5 it was also a learning experience. I was more directly involved with the business aspect, and I learned some things good and bad. I was able to take tools from that and apply it to my preparation as a solo artist and a minister of the Gospel. It was all a pruning and fine-tuning experience for me. It was a time to prepare me for what was to come, which was the release of True Story. I appreciate all of those experiences that I've had to prepare me for this. GOSPELflava.com: You know that your song "Soul Glo" is going to get some attention for the name alone. Of course, it shares the same title of one of the hilarious songs from Eddie Murphy's Coming to America. Tell us what this song was about. Sean Simmonds: My producer, Kelvin Wooten, came to me one day and said, "Man, I have this song in my head," and I guess that he had just watched the movie. He said, "Man, we could do something with 'Soul Glo". I said, "Come on man". He was like, "For real, just write something to the music that I have". I wrote to it, and of course I was not going to talk about some hair grease. I said, "Let me go ahead and come up with a clever concept behind 'This Little Light of Mine’". I would combine the two together. You let your soul be a light so that people see you, and recognize who you are. That's a child of God. The Lord revealed that to me, and I just went with it. I applied to different situations. I said, "Despite the negative on your back, just let your soul glo". It was just applying real life situations and making it catch; making it cool. After I finished writing it, I was like, "Man, this is cool". God has His ways of instilling ideas. Even though it was from a secular excerpt, I was able to instill principles, values and have message behind it. GOSPELflava.com: Tell us about your experience working with your collaborators Kelvin Wooten and Montrel Darrett. Sean Simmonds: It was phenomenal. The chemistry was so amazing. I owe a lot to Montrell because he kind of found the inner ability in me as far as being a solo artist. He found certain things in me that I didn't know that I was even capable of doing. Even though he didn’t work on a majority of the record, it was him pulling out what was in me. I was able to maximize it and spread my wings and fly. And it was awesome working with Wooten. We would go in the studio at midnight or 1 in the morning and put a song together on the spot. We wouldn’t have a song pre-written or pre-produced. We would do it together. I couldn’t have worked with two better people than Montrell and Kelvin Wooten. I had a couple of other producers. Mario Maitlin, my MD, produced the intro and "Wherever". I also has Linxkenect, who is a young R&B producer, who did "Sorry For" and "God Bless the Ghetto".